Trailhead and parking area are on Rt. 115 in Jefferson, NH (summit is in Carroll), 5.7 miles north of Rt. 3 and 0.8 miles west of Rt. 115A. Park at a pull-off on the south side of the road, marked with a historical marker for the Cherry Mountain Slide. Cherry Mountain stands alone at the west end of the Cherry-Dartmouth Range, north of Rt. 302 and the central White Mountains. Cherry is a broad mountain, composed of three peaks, the highest of which is Mt. Martha. The other two are Owl's Head and The Humps. Owl's Head and Mt. Martha are both accessible by trail and both provide fabulous views in multiple directions. Mt. 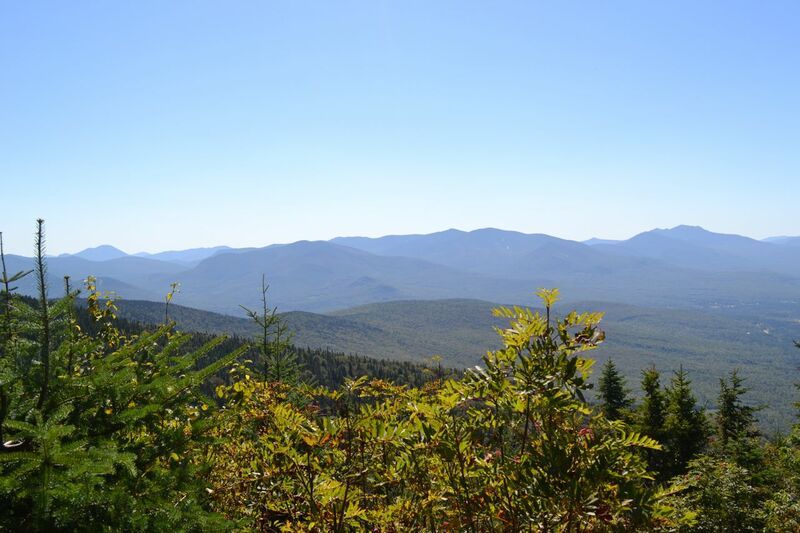 Martha offers a few limited outlooks from its wooded summit plateau, while the sharp rocky pinnacle of Owl's Head gives you one sweeping vista of the Presidential Range. The hike starts on the Owl's Head Trail, a link in the 165-mile Cohos Trail. Before you begin, walk over to the Cherry Mountain Slide historical marker to read some history about the mountain. The trail enters the forest through a narrow opening and immediately crosses a small brook. It then picks up an old road, but quickly turns left back into the woods at a trail sign. It winds through a long, muddy section on deteriorating bog bridges before beginning a very gradual ascent through open woods. After a mile, the trail makes a short descent to cross a stream, then climbs very steeply up the other bank. At the top of the bank, the trail turns left to face the incline of the mountain. It crosses an old logging road, then begins to ascend. It climbs gradually at first, but soon becomes very steep. After a long 0.8 miles of unrelenting incline, the trail turns across the slope and becomes rockier, soon to reverse direction and climb across the slope to the west. Climbing past a WMNF boundary sign and crossing a brief flat area, the trail again turns up the mountainside, this time tackling a much greater grade, but with the aid of many short switchbacks. The summit, reached at 2.4 miles from the parking area, is wooded, but a short drop over open rock leads you to the rewarding ledges just below. Owl's Head is famous for its expansive vista of the high Presidential Range, and rightly so. The Presidentials stretch out across the landscape, rising over Mts. Deception and Dartmouth. Although somewhat distant, the light gray-brown of the massive, boulder-topped alpine summits is clearly seen. From north to south (left to right) they are: Madison, JQ Adams (seen over the shoulder of Adams), Adams, Jefferson, Clay, Washington, Monroe, Franklin (small rounded area on the ridge), Eisenhower, Pierce, Jackson, and Webster. From there, the Webster Cliffs drop off into Crawford Notch. Mt. Chocorua is seen in the distance through the notch. Mt. Martha, your next destination, looms close by. From the other side of the ledges, you can see the town of Whitefield. To continue your journey, locate the sign for Martha's Mile and make a very difficult scramble off the side of Owl's Head. Now, the trail descends quickly to a low point, then begins a moderate ascent up through the spruce woods of Mt. Martha. The trail is rocky and mossy near the bottom of the climb (use caution when wet), but improves further up. The ascent is easy near the wide summit. Ferns grow into the narrow path here. Passing by blowdowns, the trail eventually becomes flat and reaches the summit 0.8 miles from Owl's Head. Across a patch of short grass is a very limited version of what you saw from the Owl's Head ledges. Turning right, a spur path leads through overgrown brush to an even more limited view to the northeast at the site of a former fire tower. The spur continues past the tower footings out to the best viewpoint on Mt. Martha, a limited overlook toward the central White Mountains. Seen across the valley are Mt. Carrigain, Mt. Hancock, Mt. Hale, the Twins, Mt. Garfield, the Franconia Ridge, and Cannon Mountain.